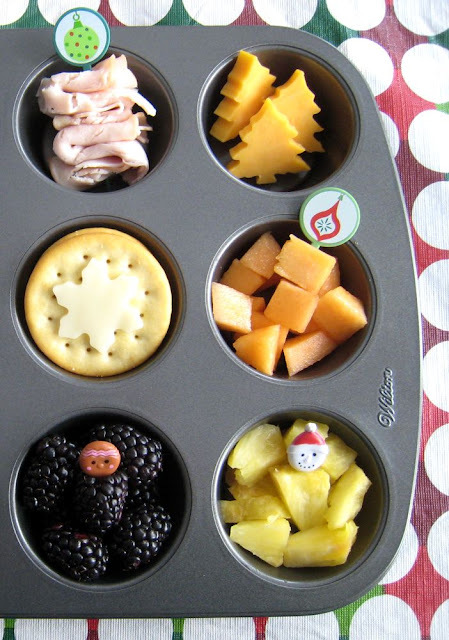 BentoLunch.net - What's for lunch at our house: Muffin Tin Monday - Christmas themed! Muffin Tin Monday - Christmas themed! With all the holiday chaos, we haven't had much of a chance to do Muffin Tin Monday in a few weeks. But since we are squared away in Canada right now, we borrowed a muffin tin from Nana and opted for a festive little lunch for Ben. Nana also provided some fun new mini-cookie cutters for us to use. Ben has deli turkey rolls, cheddar Christmas trees, made from the good Canadian cheese as Mr. Ben says, crackers, topped with a mozzarella snowflake, cantaloupe, pineapples and blackberries. Nana stocked up on Ben favorite fruits, so we have one very happy little guy! I love your picks! The food looks yummy! Looks delicious! :D So festive and fun! I love that you packed your picks! I started doing that on trips to my sister's. I bring some mini cutters and some picks, and some EasyLunch boxes just in case I get to make something fun for the girls! I am crazy jealous that you found fresh blackberries somewhere!